When the snow starts to pile up, why reach for the shovel or a blower when you can mount a plow on your UTV and push that snow out of the way. Here at Side By Side Sports we offer a wide variety of plow kits, which means we certainly have a system to suit your needs. We offer everything from winch controlled straight blade plow kits and articulating plow kits to full hydraulic utv plow systems. In addition to our plow systems featuring steel blades, we also have kits using the new poly blade. Typical blade sizes for the UTVs are 60" or 72". We carry trusted brands such as EMP, Moose, KFI, Warn, Cycle Country, Wicked Built and many more. 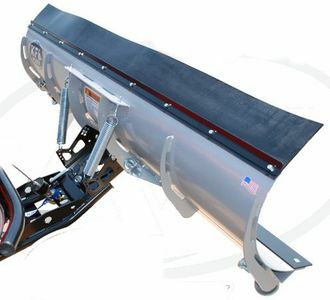 We have plow systems for virtually every UTV. Whether you are looking for a Polaris Ranger, Can Am Defender, Polaris RZR or Honda Pioneer. We have you covered.